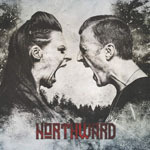 Share the post "Album review: NORTHWARD – s/t"
The cover art image of the two main protagonists here – Nightwish vocalist Floor Jansen, and Pagan’s Mind guitarist Jørn Viggo Lofstad – photoshopped head to head, jaws agape and bawling at each other, offers only limited clues of what to expect from this Dutch/ Norwegian hard rock, cross border collaboration. Dating back to 2007, with the songs written in 2008, but left lying under a dusty layer of conflicting schedules, the project was finally resurrected last year and recorded using a backing ‘band’ including TNT bassist Morty Black, and drummers Stian Kristoffersen (Pagan’s Mind) and Jango Nilsen. There’s also a cameo appearance from Lofstad’s Pagan’s Mind keyboard player Ronny Tegner, and a duet between Jansen and her sister Irene. As a more accurate signpost, the video for the lead single – ‘While Love Died’ – gives a pretty good picture of what Northward offer. Visually, featuring just Jansen and Lofstad, both clad in back with her baring her teeth and he in a Motörhead tee with Gibson Les Paul slung low, and both with Marshall amps turned up to 11, it’s a veritable powerfest of screaming guitar and vocals. Vocally, some distance removed from Nightwish, with almost no symphonic elements on show, and sonically less overtly metal than Pagan’s Mind, it’s actually a blast – high octane, fun fuelled, no frills, rock ‘n’ roll – taking both artists outside of their normal environment, with Large Hadron Collider size results. There’s some magnificent singing, and some wonderfully unrestrained guitar playing. If there’s a parallel to be drawn, it’s with Slash’s recent effort Living The Dream. Both albums are hewn from the same granite but, while Slash struts like a show pony, Northward is incomparably febrile; bristling and bucking with vitality. ‘Storm In A Glass’ is the best piece of power ‘pop’ you’ll hear this year – impossibly catchy, and ‘Drifting Islands’ – Jansen’s duet with sister Irene - doesn’t lag far behind with a real heavyweight chorus riff. ‘Paragon’ is a rush of AOR with a dark underbelly, ‘Let Me Out’ simply erupts, ‘Big Boy’ is a monster with soul and funk elements, and ‘Timebomb’ is simply irresistible. There are subtleties – some Spanish guitar amidst the maelstrom of ‘Get What You Give’, and the acoustic ‘Bridled Passion’, although the latter just leaves you aching for the next guitar fuelled adrenaline rush – duly delivered like a shot in the vein by the closing paring of ‘I Need’ and the title track. An album that hits this hard while being so accessible is a rare thing. There’s an energy and accessibility here that is just impossible to ignore, and for fans of female rock singers and unfettered guitar playing, Northward is a no brainer. This entry was posted in ALBUM REVIEWS, ALBUM REVIEWS (Mobile), All Posts and tagged album, Floor Jansen, hard rock, Jørn Viggo Lofstad, melodic rock, metal, Nightwish, Northward, Pagan's Mind, review. Bookmark the permalink.